Ph.D Engineer Boris Teper has invented a remarkably compact yet effective torque-setting tool that is ideal for tensioning scope ring fasteners and action screws on rifles. The Torque Settings Driver from Borka Tools is brilliant in its simplicity. The lightweight tool is basically a lever, with a series of hex slots through which a spindle is fitted. The slot position sets the effective lever arm length. How does the tool prevent over-torquing? On one end of the tool is a handle with a spring-loaded ball detent. 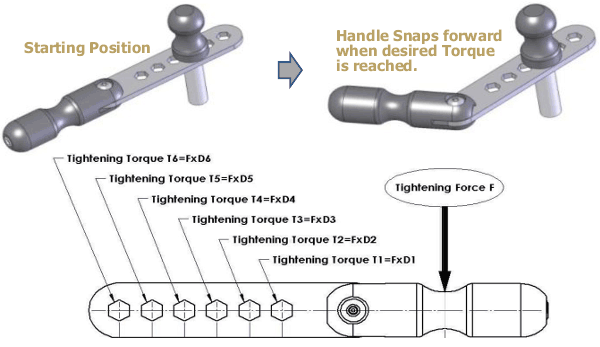 Once desired torque is reached, the handle overrides the detent, snapping forward so you can’t crank too hard (figure 2 below). Borka offers many versions of its tool, with torque ranges from 10 inch-lbs. up to 72 inch-pounds. 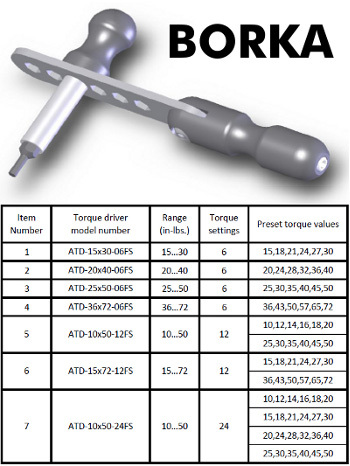 The basic Borka driver, priced at $45.00, offers six (6) preset torque values. For $10.00 more Borka sells a driver that offers twelve (12) preset torque values. This 12-setting tool, which is not any bigger or heavier than the 6-setting model, is cleverly designed — you simply flip it over to switch from the first six torque settings to the second six. This works because the handle has variable “break” resistance depending on direction of travel. Smart. 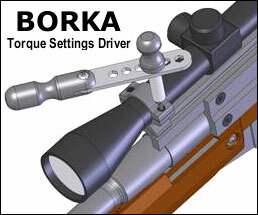 Borka’s most popular torque tool is the 12-setting $75.00 “Military Grade” driver, model ATD-15×72-12FS-MG. This offers a dozen torque settings from 15- to 72-inch-pounds. We recommend the “Military Grade” model because it has torque settings laser-etched on the surface of the driver arm (see video). That way you’ll always know your torque values. The “Military Grade” model also comes with 1/4″ hex to 1/4″ square (M) and 1/4″ square (F) to 3/8″ square (M) adapters. The Military Grade Model, intended for use in the field by both DOD and LE personel, has already proved popular with “civilian” tactical shooters. You can store the tool in the supplied fabric carry pouch, or stash it (with needed bits) in your range kit. Where can you get a Borka torque setting driver? All models can be purchased directly from Borka Enterprises by emailing info@borkatools.com. You can also purchase through Manson Precision Reamers, (810) 953-0732. (Dave Manson worked with Boris Teper to get this product to market.) In addition, four models are available from Brownells: ATD-20×40-06FS (Brownells item #080-000-734), ATD-25×50-06FS (Brownells item #080-000-735), ATD-36×72-06FS (Brownells item #080-000-736), and ATD-15×72-12FS (Brownells item #080-000-737).